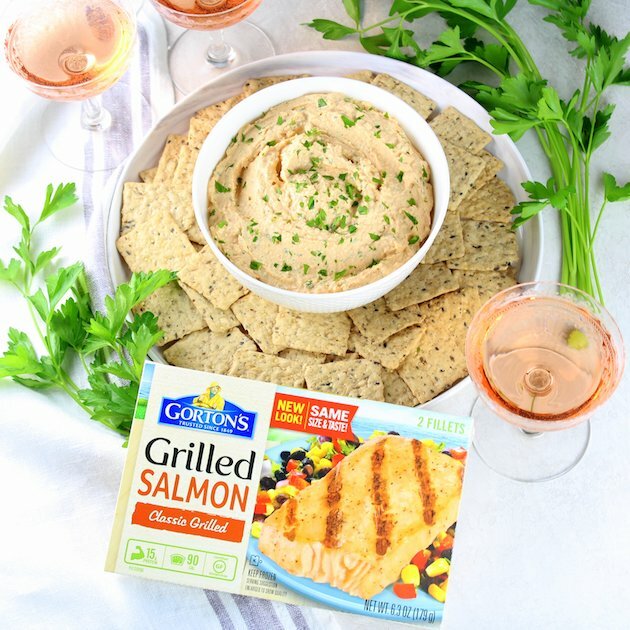 Thanks to our friends at Gorton’s for sponsoring this Smoky Salmon Cream Cheese Spread… the most delicious and easy appetizer to serve at your next party! 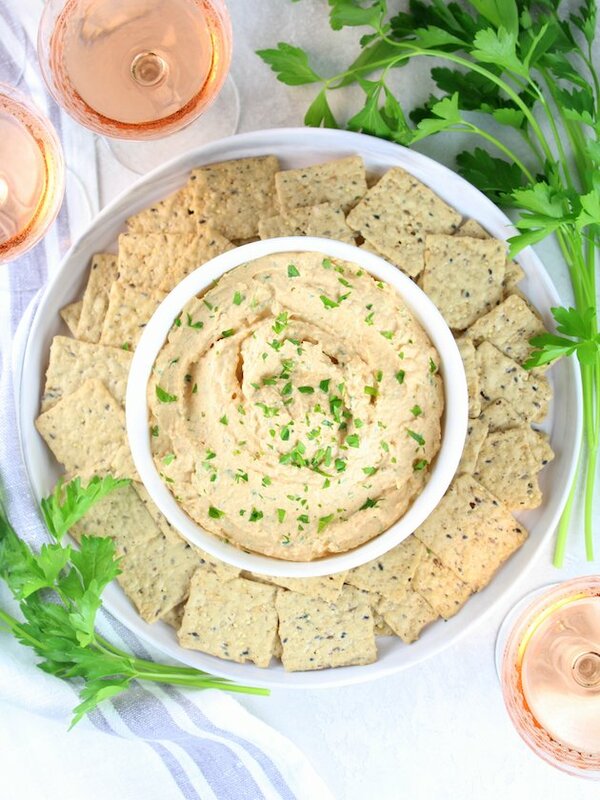 Creamy and smoky, rich and flavorful, this dip will be the star of your spread! I’m a big believer that you should always have something yummy on hand, just in case your neighbors pop over. Or you’re at the kids’ Christmas cantata, when you decide to be social and invite some of your friends back for snacks. It doesn’t need to be complicated or gourmet, just delicious, quick and easy. Because it’s not really about how amazing the food is, it’s about the memories you made with those you love and value. Life’s too short to wait until your house is perfectly clean and you’ve catered the most delicious meal to fellowship with your favorite friends. Lucky for me I learned this many years ago. AND Gorton’s Seafood ready and waiting in the freezer! That way when we’re with friends, and feeling the moment, we can be like, boom: “hey, why don’t you guys come back to our place and we’ll open a bottle of wine and have some snacks?” Love it! That ability to invite friends over at a moment’s notice and create some fun and forever memories. After all, spontaneity is the spice of life, my friends. Life is so busy and full of work, school, & sports… sometimes we don’t have the energy or forethought to plan get-togethers with our people. So, we miss out on the rich community we all crave that recharges and refreshes us. Here’s what I’m proposing: Have a few things in your pantry at all times that allow you to be spontaneous and entertain at a moment’s notice. Nothing overly fancy, just easy and good. Use some of my suggestions from above, or come up with your own ideas from your favorite snack rotation. Then you’ll have the confidence in the moment to create space and time for those around you that you’re doing life with. Because truly – at the end of the day, your friends don’t really care if your china hutch is dusted or your floors are vacuumed. All they really care about is catching up, being together and laughing out loud – a lot. What do you say? Let’s start a movement. One that’s about charting our destiny, AND enjoying the journey along the way. … And three cheers for my favorite seafood purveyor: Gorton’s. Because they’re always helping a girl out with easy, quick and delicious seafood appetizers! They have so much offer. 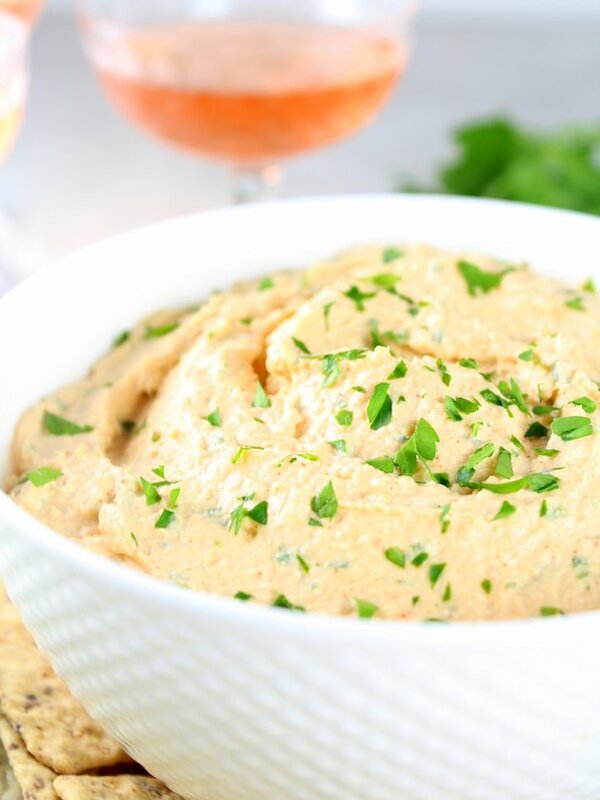 Like shrimp scampi that allows me to have the most amazing Cheesy Buffalo Shrimp Dip on the table in 15 minutes. Then there’s their lightly breaded jumbo shrimp… freezer to table in 20 minutes with a side of pineapple salsa and firecracker sauce. And finally, their grilled salmon filets. Baked and flaked and turned into the most scrumptious Smoky Salmon Cream Cheese Spread I’ve ever tasted. All in a matter of minutes. 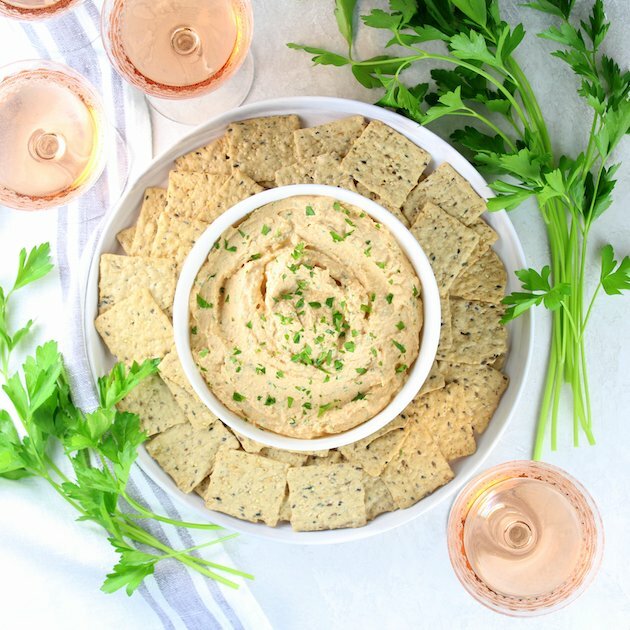 Just add crackers, cucumber slices, or bagel chips and you’ve got the most fabulous spread your friends could ask for. Especially at a moment’s notice. I love knowing that I can truly trust Gorton’s. They find and provide the freshest and highest-quality seafood while protecting the world’s resources. 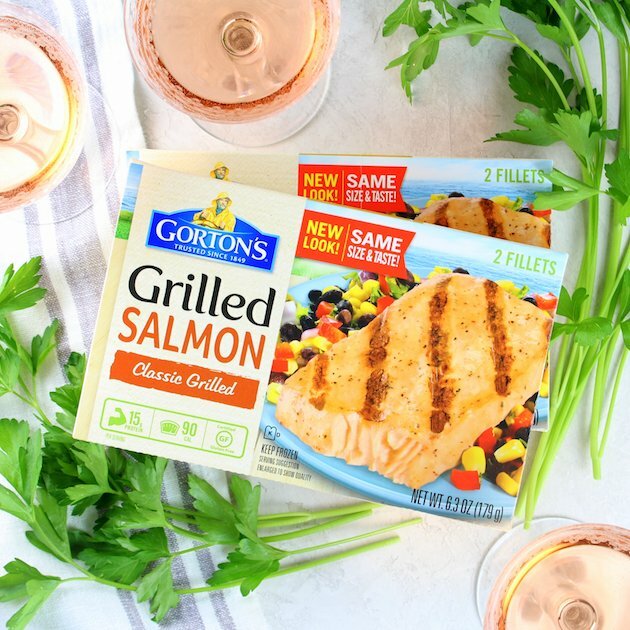 And in today’s recipe that translates to 100% wild–caught salmon, with simple ingredients and completely gluten free. So healthy and so delicious! Here’s How You Make Smoky Salmon Dip! First, get those salmon fillets in a 400 degree oven for 16 minutes. While those are cooking, mix together your cream cheese, garlic powder, smoked paprika, liquid smoke, lemon juice, and salt either in a food processor, with a mixer, or by hand. When the salmon has finished cooking, allow it to cool, then add the green onions, parsley, and salmon to the mixture (if mixing by hand – flake the salmon first), and blend together. Chill and serve with your favorite crackers, chips or veggies. 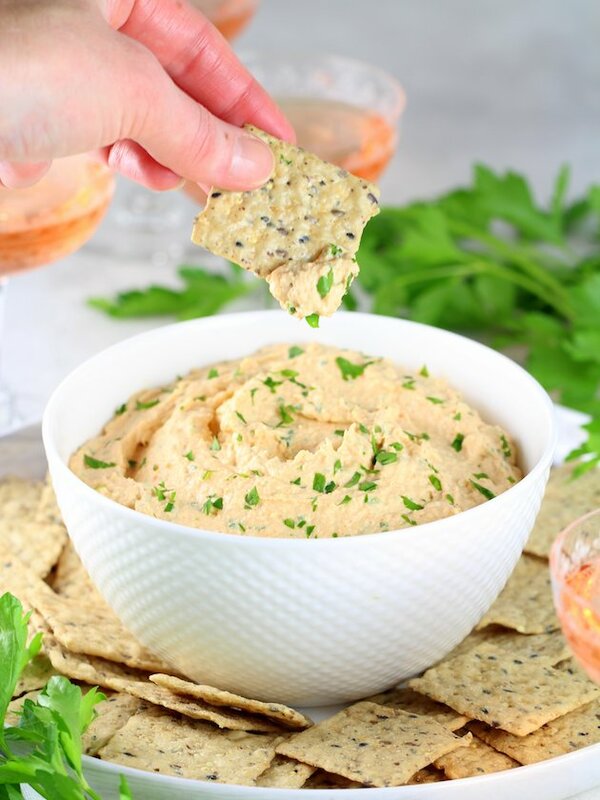 Smoky Salmon Cream Cheese Spread: a delicious and addicting appetizer that will have your guests stunned at your flexibility to pull together a fabulous last-minute night with friends… and raving about the incredible chef and hostess you are. 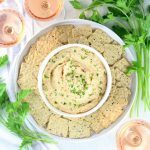 Smoky Salmon Cream Cheese Spread... the most delicious and easy appetizer to serve at your next party! Creamy and smoky, rich and flavorful. Preheat oven to 400F. On a parchment-lined baking sheet, bake salmon fillets for 16 minutes. Meanwhile, mix together cream cheese, salt, garlic powder, smoked paprika, liquid smoke, lemon juice, & hot sauce either in a food processor, with a mixer, or by hand. When the salmon has finished cooking, allow it to cool, then add to the mixture along with the green onions and parsley (if mixing by hand, flake the salmon first) and blend together. 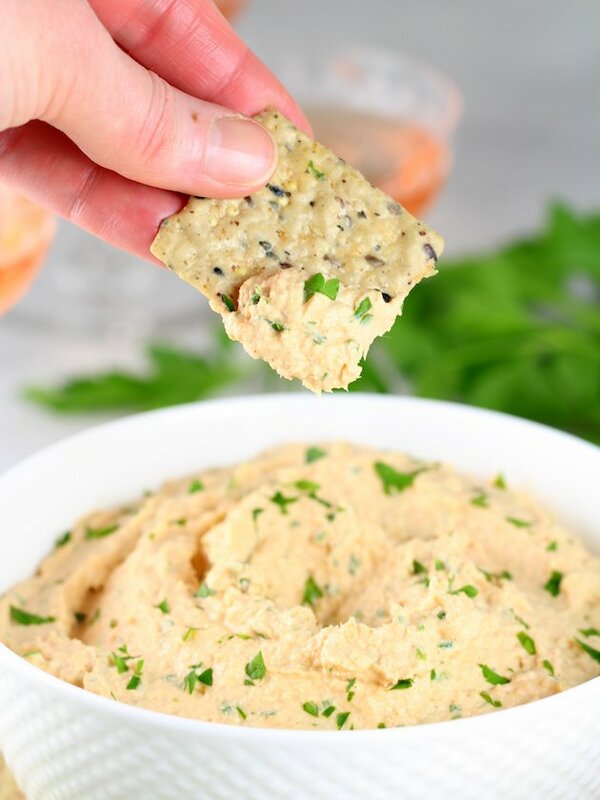 Chill for about one hour, then garnish with remaining parsley and serve with your favorite crackers, chips or veggies. Looking for more holiday entertaining recipes? Try our Firecracker Shrimp With Pineapple Relish or this Cheesy Buffalo Shrimp Dip.